Among the many tools that Excel provides for statistical analysis are some related to variation. Let’s take a quick look at these variation-related worksheet functions. Although it’s rare to calculate just the sum of squared deviations, you may find a need to apply this function. 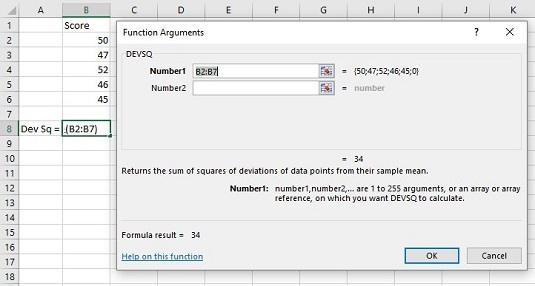 One more Excel function deals with deviations in a way other than squaring them. you can put the absolute values of the deviations into a table like this one. The average of the numbers in the third column is 2.4. This average is called the average absolute deviation, and it’s a quick and easy way to characterize the spread of measurements around their mean. It’s in the same units as the original measurements. So if the heights are in inches, the absolute average deviation is in inches, too. Like variance and standard deviation, a large average absolute deviation signifies a lot of spread. A small average absolute deviation signifies little spread. This statistic is less complicated than variance or standard deviation, but is rarely used. Why? Statisticians can’t use it as the foundation for additional statistics you meet later. Variance and standard deviation serve that purpose. 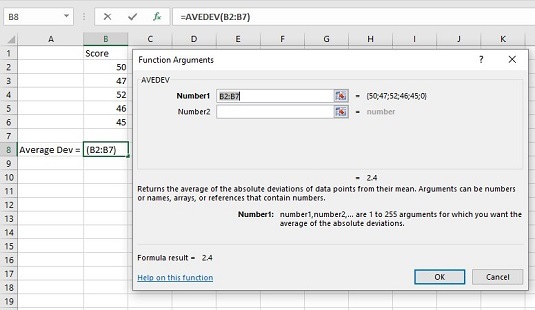 Excel’s AVEDEV worksheet function calculates the average absolute deviation of a group of numbers. The image below shows the AVEDEV dialog box, which presents the average absolute deviation for the cells in the indicated range. The AVEDEV Function Arguments dialog box.